The Diamond Pony is a smaller version of the Classic Plain that is ¼” thick. 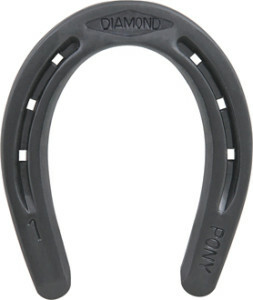 Forged from special steel (like the regular horseshoe) the Diamond Pony shoe offers extended wear. 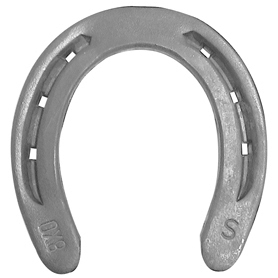 Six properly spaced nail holes fit the average pony hoof. Shoes are symmetrical. Punched for 4.5 Race nails. Note: For No. 2 Pony shoe, use Diamond 000 Bronco. 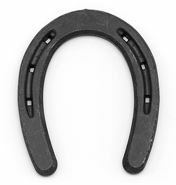 The Standard Pony shoes have a very nice shape for ponies and even fit some miniatures. Shoes are symmetrical. Punched for 3-1/2 Race, 4-1/2 Race or 4-1/2 slim.